Looking for a venue for your next event? 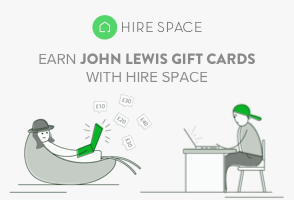 If you book a venue via Hire Space - we will both earn John Lewis Gift Cards. They have over 4,000 venues from high profile classics to brand new spaces. You’ve referred a friend. More friends equals more gift cards so why not share it on social or drop your nearest and dearest an email? When they book a venue via Hire Space for their event, you both will receive £10 worth of John Lewis Gift Cards for every £1,000 they spend. What would be the estimated budget for your friend's event? I don't know anyone who is booking an event soon. Who would want a referral code? From the manager booking a creative workshop to a friend helping to organise their sister's wedding. Most people looking for venues are not professional event organisers. Send the code to your friend's and colleagues and you'll be surprised who will earn you gift cards! Can I refer more than one person? Yes, the more you share the better! There's no upper limit on John Lewis gift cards so if you share the code with 100 of your friends and they all book an event you could earn enough for that new Ultra HD 4K TV you've been eyeing. Yes- even if you are involved in the event planning too. Just make sure the enquiry is under their name. When can I get spending? Gift cards are earned when your friend books an event with a venue. As soon as Hire Space receives confirmation from the venue, we send out the gift cards. What's the catch? How does Hire Space make money? No catch. Venues pay us a fee for the Hire Space service and have a price guarantee to ensure the same rates or better for Hire Space customers. This means we're completely free for you and friend's to use and we can offer John Lewis giftcards for first time users.